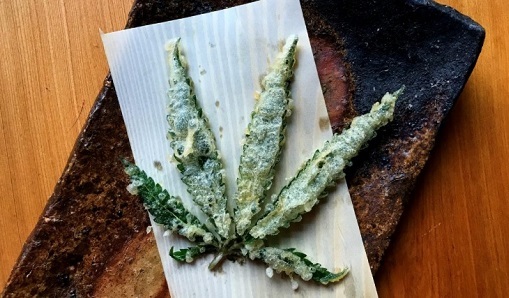 Along with the tempura cannabis leaf, Shibumi’s special dishes include vegetables flavored with cannabis-infused sauce, made like a miso paste, which is often mixed in with sesame paste in Japan. You enter the sleek Shibumi restaurant via a clandestine doorway next to a parking garage in downtown LA. Now the hush-hush concept continues inside – those in the know can request off-menu cannabis-infused dishes, including a battered pot leaf.